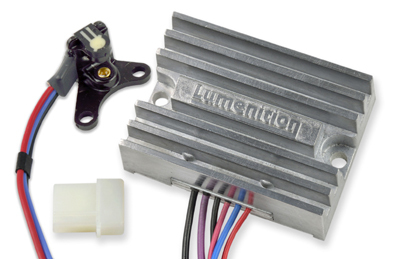 The Lumenition standard Optronic and Performance Optronic Ignitions convert a large range of contact breaker distributors to electronic ignition. It is immune to dirt, cam wear and dust, has no moving parts to wear out and is maintenance free. With more than half a million sold Worldwide over 43 years, Optronic ignitions are the premier contact breaker replacement system. The Optronic ignition replaces points and condensors by mounting an optical switch in the distributor using a distributor-specific fitting kit. A fan-like “chopper” fitted is over the distributor cam, rotates through the optical switch, breaks the infrared beam and triggers the external power module to fire the coil. This produces a perfectly timed, rock solid spark. Only 3 wires are connected to the vehicle: one to the iginition switch, one to the vehicle body earth and the third to the negative terminal of the coil. The engine is then ready to be timed. By using the distributor's original vacuum and mechanical advance mechanism, Optronic ignitions ensure your engine timing is the one the manufacturer developed for the vehicle. Highly reliable with many units still in operation after 25 years. Improves performance of older or worn distributors. Fully compatible with Lumenition and Micro Dynamics rev limiters and shift lights. For less demanding application in classic 4 and 6 cylinder vehicles of the 1960's to 1980's fitted with Lucas 20 or 40-series distributors (e.g. 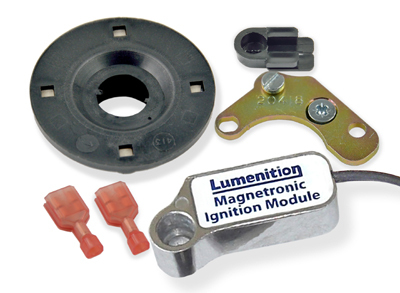 from 1959 to 1985) or for the VW Beetle, flat-4 cylinder engine, a Lumenition Magnetronic ignition offers an alternative, lower cost electronic ignition to the Optronic without sacrificing the Optronic's proven reliability. "A trigger disk fitted with high-power nyodimium magnets is fitted over the distributor cam and rotates over the rugged die-cast metal module case, triggering a sensor in the Magnetronic module which fires the coil. Mounted wholly inside the distributor body installation could not be easier. With one screw needed to fit the module and two wires to connect to the coil terminals, installation should take about 15 minutes. Re-timing the engine is performed by rotating the distributor body, just as you would do with points. 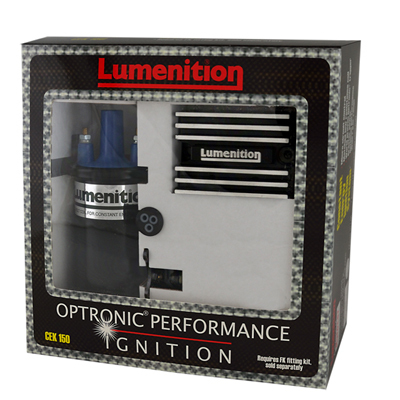 The Lumenition Performance Optronic electronic ignition is suitable for all engines using a single ignition coil. It is especially suited to performance engines up to 12 cylinders and race or rally vehicle. Replacing contact breakers and condensors, it needs no maintenace and has no parts to wear out. With all the reliability of the standard Optronic ignition it adds the Lumenition constant energy coil, which gives a fully saturated spark far higher up the engine rev range than possible with a standard coil. Fully compatible with Lumenition and Micro Dynamics Rev Limiters and shift lights for complete engine protection..
High output constant enegy ignition coil electronically matched to power module. Microcircuit control of the coil current giving optimum performance across speed and voltage range, ensuring maximum coil spark energy. Automatic switch off on engine stop, preventing coil damage if ignition is left on. Recommended for all engines sizes and with a maximum 8,000 rpm on a 12 cylinder engine. The Standard Optronic system is ideal for all road and classic cars up to and including 8 cylinder engines with a special version for boat engines. The recommended ignition coils are the Lumenition MegaSpark 4 coil-and-ballast-resistor combination or the MegaSpark 6 unballasted 3 Ohm coil. Usually supplied as a power module and optical switch in one pack and a fitting kit designed for your particular distributor, the standard Optronic is also available as the PMC-50, which includes the MegaSpark 6 unballasted ignition coil as well as the Optronic optical switch, power module and a power module mounting bracket which fits on the coil mounting bolts and avoida the need to monut the power module directly to the vehicle bodywork (also available separately). A fitting kit for your engine's particular distributor is also required. Fixed dwell giving higher performance from existing coil under all conditions. Recommended for all engine up to 8 cylinders.